An 11-year-old author. That's Ronald "Cheesie" Mack. 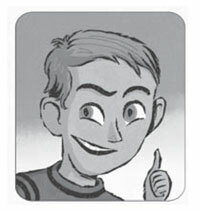 He's not a genius or anything, but he remembers everything that happened before, during, and after fifth-grade graduation, and he's written it all down in his own unique and hilarious way—with lots of lists, drawings, and splenderful (that's splendid plus wonderful!) made-up words. Cheesie's story is about more than his boring graduation ceremony and the not-so-boring party afterward; it's also about his ongoing battle with his evil older sister, a mouse plot gone wrong, and his best friend Georgie's discovery of a mysterious old coin that just might change the summer completely. Cheesie—with a little help from Steve Cotler—writes about family, friendship, and tough choices in an unforgettable voice that will have readers laughing out loud and making their own BLART sandwiches. The phone call was from Georgie Sinkoff, my best friend. "GET OVER HERE RIGHT NOW!" he screamed into my ear before I could finish saying hello. And then he hung up on me. I ran outside, yelled to Mom where I was going, and sprinted into the gully behind my house, which is in Gloucester, Massachusetts, where I have lived my whole life. 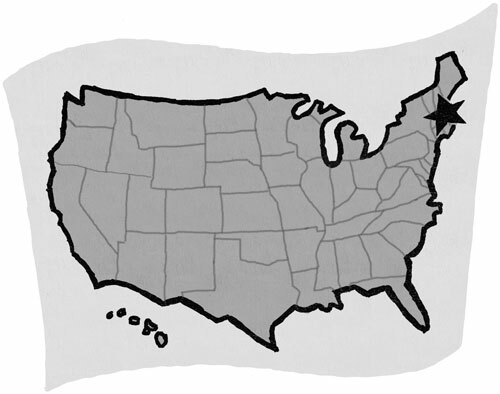 If you don't know where Massachusetts is, look in the upper right-hand corner of the United States. I left Alaska out because it's too big. Mass (sometimes we call it that) is a small state. Only six states are smaller. Even Hawaii is bigger, but it's kind of cheating because lots of Hawaii is ocean. I have a U.S. map on my bedroom wall, and because I look at it every night before I turn out my light, I have almost memorized it. Gloucester (people here say GLAH-stah... weird, huh?) is the oldest fishing port in America. It was founded in 1623, only three years after the Pilgrims landed at Plymouth Rock, which is also in Massachusetts somewhere. I have never seen Plymouth Rock, but rocks last almost forever, so I guess it's still there. Our houses are three blocks apart if you use the streets, but Georgie and I only go that way if we're on our bikes. There's a scrawny little stream in a scrawny little gully that separates our backyards, and it is so narrow that last year Georgie launched a balloon filled with chocolate pudding all the way from his bedroom window over the trees and the gully into my backyard, where my sister was playing with her friends. I told you he has terrific ideas! 1. I did not fill the balloon with pudding. 2. I did not touch Georgie's huge slingshot. 3. I did not help pull back the rubber part. I did not do any of these things so that if Mom or someone asked, I would not have to lie. I did help aim it, kind of. When the pudding bomb landed and splashed chocolate on you-know-who, the girls screamed like the universe was exploding—and even though we got yelled at, it was cool. I trotted through the gully on the path that Georgie and I made, then up the other side and through the won�t-close-gate into his backyard. Once inside his back door�I never have to knock�I yelled for him. He yelled back from the basement. His house, like mine, is really old. The basement and stairs are made out of wood, and the floor is mostly dirt except for the concrete part where Mr. Sinkoff keeps his tools. I could see a shadow moving on the basement floor, so I knew Georgie was directly beneath me, under the stairs. When I reached the bottom, Georgie stepped out and grabbed me, talking real fast. �I found something big! Really big!� There were cobwebs in his hair. He had one hand behind his back. 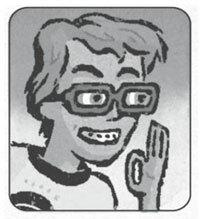 Georgie has reddish-brown hair, greenish-brown eyes, braces, and really cool glasses with bright red rims. He is already eleven and is almost twice my size. He is good at games where being big is an advantage, like basketball and football. My best sports are soccer and baseball because I am wicked fast and very excellent at catching flies. I have brown hair, brown eyes, and a whitish scar on my thumb where a fishhook stabbed me when I was on a lake with my dad. I was eight and fooling around. Don�t ask. Georgie and I go to the same school, have always had the same teacher, and in the summer, always go to camp in Maine. He held out a piece of paper folded up small, then opened it. Inside were a silvery metal heart on a silvery metal chain and one penny. I picked up the necklace and held it high between us. The lightbulb on the basement rafters was not very bright, but the heart sparkled as it spun slowly. �I bet a hypnotist could use this to hypnotize people,� I said. Georgie didn�t say anything. Maybe I�d sort of hypnotized him. I placed the heart necklace back on the paper in Georgie�s hand and examined the coin. 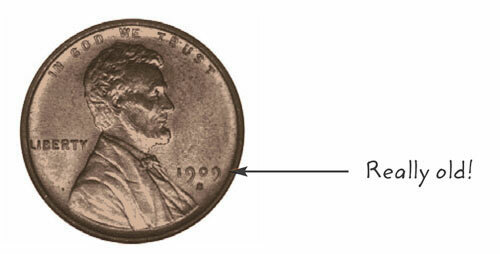 The back looked a lot different from any other penny I�d ever seen, but the front had the same face on it: Abraham Lincoln, our sixteenth president. 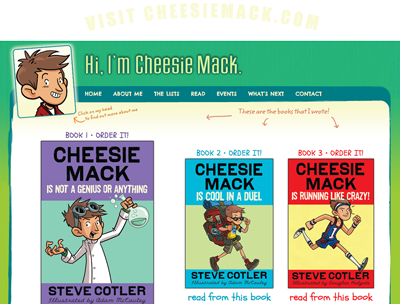 Read from Book 3: Cheesie Mack Is Running Like Crazy! Excerpt copyright © 2011 by Stephen L. Cotler. Illustrations copyright © 2011 by Adam McCauley. Published by Random House Children's Books, a division of Random House, Inc., New York. “What's the matter?” Georgie asked once we were inside and changing out of our swimsuits. Cheesie offers online, hip, fun extensions to the reading experience. It's new. It's 21st century. It's Cheesie Mack! 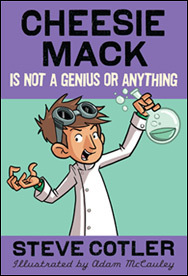 "Fifth-grader Ronald "Cheesie" Mack's problems (like how to outsmart his evil older sister) may be ordinary, but in the hands of first-time author Cotler they're plenty entertaining. Playful use of language. Many entertaining bit characters. Cotler blatantly sets readers up for Cheesie's next adventure; after this installment, they'll be ready for it." "Ronald "Cheesie" Mack and his best friend, Georgie, are about to graduate fifth grade and embark on the best summer ever. Readers will be happy to learn that Cotler's debut is the first in a new series. Cheesie chattily narrates his own story; his voice rings true, and the other characters are a gently quirky, appealing lot. 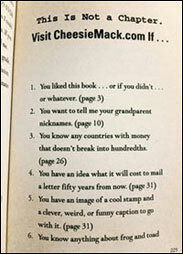 His periodic invitations to read posts on or add stories to the CheesieMack.com website will hook denizens of the digital generation." "Ronald, aka Cheesie, Mack is looking forward to a summer of scheming with his best friend, Georgie, terrorizing his sister June "the Goon," and finally attending camp with Georgie as cool older campers. [T]hen Georgie finds an old letter containing a century-old penny and a locket, a mystery that eventually leads the pals to the Haunted Toad, a local rundown mansion. This is Cheesie's story, and his easygoing, accessible voice will certainly appeal to middle-grade readers. From the plot to unleash mouse madness at the school graduation to his obsession with besting his older sister, the action here is all fun and games." "Ronald Mack—better known as "Cheesie"—is an almost-11-year-old with a knack for silliness and trouble. Cheesie's best friend, Georgie, is with him every step of the way. When the boys find a mysterious envelope, they're in for the adventure of a lifetime. [A] rollicking read." Like special features and extras on the best DVDs, Cheesie's books include lots of website links that enlarge the reading experience…exactly what today's online-savvy kids are looking for.